Even though the LG G5 won't be unveiled until February 21st, the manufacturer has introduced the Quick Cover case that it will sell for its new flagship phone. The LG G5 Quick Cover case borrows generously from the one produced for the LG K10, which allows users to take calls without opening the case. The LG G5 Quick Cover does respond to touch, letting you set the alarm without having to open it. LG has already teased the phone's always on feature, and does so again by showing the display of the LG G5 as viewed through the cutout on the front of the case. The picture shows the time, date and four notification icons underneath. LG also reveals that the LG G5 will have a metallic build. 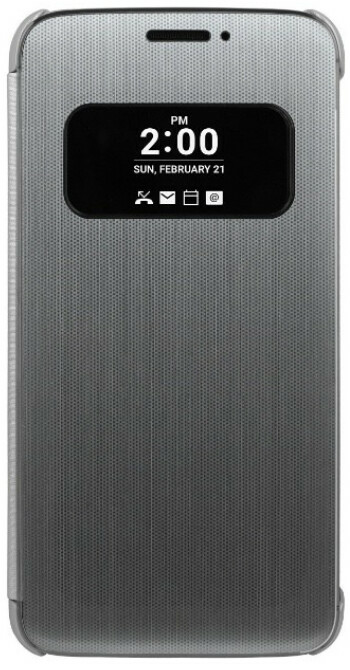 In its press release today, the company points out that the Quick Cover sports a unique film and a glossy metallic finish that complements the LG G5. The LG G4 and LG G3 were both made with a plastic build. Earlier today, we passed along the results of a trip made through the Geekbench benchmark test by the LG G5. The test confirmed that the phone will be powered by the Snapdragon 820 chipset with 4GB of RAM inside, and Android 6.0.1 pre-installed. And improve the battery life. I concur. I was just about to buy the Gold 64GB Nexus 6p on Amazon because it's only $499. But, I'm like, I really should wait. I invested into too many Qualcomm Quick Chargers (powerbank, and wall chargers). And maybe the G5 wil have USB-C, which I also invested in. I'll be patient. This is the phone to wait on for the first part of the year. I upgraded from the Nexus 6 to the Nexus 6p, its a good phone but i do need the SD card slot and hopefully LG keeps it and adds a bigger battery. I'm not sure that battery size is their problem. It's optimization. There are a fair amount of phones that had batteries smaller than (or equal to) the capacity of the G3 and G4 that had a far better battery life. Its also that they get fuc*ed over with hardware. G3 had QHD with snapdragon 801 which is too weak and G4 had 808 which is pretty bad too. Now things are pretty bright with snapdragon 820. I really like LG phones but the only thing keeping me from buying it is battery life. UI is awesome imo. It was the craptastic 810. It is a terrible chip for efficiency. A bunch of other phones with the 810 had far superior battery life than the G4. LG has had problems with battery life for years. This isn't something you can blame on Qualcomm. I prefer LG UI much more than stock android skin.i just hate stock android notification drawer.LG ui has much more functionality and features. I don't remember ever having any T-Mobile branding on any phone I bought from them. I didn't even know this was a problem on other carriers. No wait, I take that back. I think the last sprint phone I had with branding on was the S3. So is this something Verizon and AT&T are still doing? Are you for real? Where have you been? All of the Androids on ATT and Verizon have a huge brand on the back or the front, I've seen some TMO phones with the brand as well. I'm asking because I have never bought a phone from AT&T or Verizon, so I honestly didn't know. And since most people keep their phones in cases, it's not like a phone's rear is something you ever really see anyway. Really? Those must have been cheaper or older models. Because I certainly haven't seen any branding on the flagships from LG, HTC, Sony, or Samsung. At least not last year or the year before that. I'm not saying they don't exist, I just haven't personally come across any. So what's the point of "Always ON" feature? Drain battery life? It's just a marketing turn, one can bet the 'Always on" refers to being able to see and use the screen despite the closed cover. I dont know whether to make a jump on the G5 or wait a couple months for the V10 successor. Oled and a drastic change in the UI is what's needed. "Featuring a sleek gray metallic finish" -From the G4 product page "a glossy metallic finish" -From this announcement Seems like metallic finish to them means the color and texture, not the material. This looks like a mix of S-view cover and clearview cover that Samsung has. This looks like the Quick Window and Dot Case. All i want is an WOLED screen.